And it is certainly not funny to have some other weirdos quickly pouncing on how Windows 10 installs flawlessly so that anti-Microsoft sentiments could be provoked, on Facebook (not on LinkedIn or in any professional forum) but singularly amiss in reporting their own issue of a port not being allowed access because they want to make money from websites which also make use of the same server ! Does the word 'hypocrisy' come to your mind? And it is most certainly not funny, when you find the word 'hypocrite' hitting the news in the social media in a totally different context. Such is how 'mass moronic' mentality is frequently manipulated to propagate moronity that makes no sense when seen in the 'correct' context but due to the 'symbolic' nutcases (the types that go 'it is like saying...' comparison makers) that create 'smoke' with their ignorant shouting of 'unrelated' issues, which is then taken by the 'inexperienced' nutcases as public opinion, interpolation of context happens and gets blown out of proportions for 'mass misrepresentation and misinterpretation'. 2. type 'start ... (... is the path to the rg file location)' and put your newly obtained .pem (certificate file) in the location. 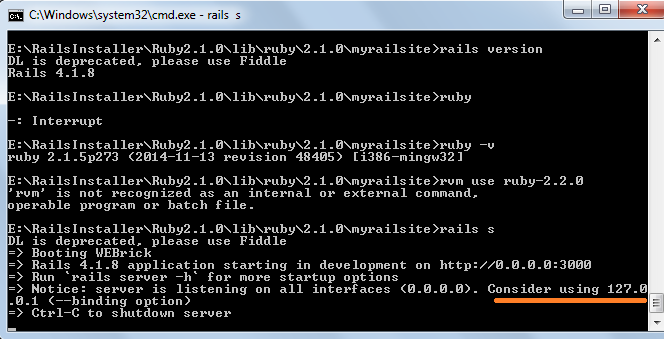 Re-start rails and the SSL connection will be successful for Rails to download any new gems from the ruby server! Another common error could be in the mySql installation - all these issues are specific to Windows and open source softwares not because of any problem with Windows (which could be hugely contested) but because of how the primary framework on Windows, the .Net framework, consumes third-party or open source software. This means that if you already have a .net connector for MySql then using the -d option with 'rails' will cause a problem because the service running MySql somehow 'expects' the old password associated with the connector, even if a new MySql instance has been configured! Best is to uninstall the connector and re-configure MySql before using it with rails. Another common problem in Windows is that because the 'localhost' is usually configured with the default ip address set to some ASP.Net or Windows Web App Server, 'rails server' may return n ip address for a newly created website. It becomes useful to know that the --binding option set to the default localhost address will allow the website access. Ps: On re-check, without running any Windows local web app (which means no app server listening in on any ports), the default localhost IP gets used without the --binding option ! Almost like how Mozilla says "This is embarrassing!" for its own errors as if expecting me to think that I should be embarrassed and Moz is announcing it on my behalf ! :D Seriously ! !